Things have been busy for me recently, so here are just a few things that I’ve wanted to mention on the blog. It’s a bit more higgelty-piggelty than other posts, but there’s tea involved with it all so that will have to do for a theme. First, happy Lunar New Year (aka “Chinese New Year”–China being homeland of tea). 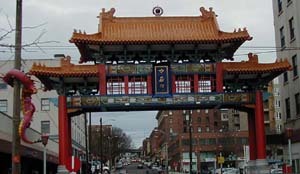 My partner and I went down to Seattle’s International District for the celebration last weekend and I took a photo of the new traditional Chinese gate that was ceremonially revealed for the new lunar year. (What was actually revealed was the plaque in the center that basically says “China Gate”.) We were given hong bao or red envelopes with chocolate coins inside, and since it was crowded we went home to have tea after picking up a few goodies at the local Asian markets. May Cai Shen (aka Bi Gan, or the God of Wealth) be kind to us all this year–as well as Shen Nong, the emperor who supposedly discovered tea! Okay, next–tea in the media! On his most recent appearance on Oprah, Dr. Mehmet Oz revealed his Ultimate Anti-Aging Checklist which included the recommendation to drink 4 cups of white or green tea daily for the antioxidants. While there are a couple of things that he said which fall under several listings on my own Common Tea Myths article, such as the supposed levels of caffeine, I certainly can’t argue with drinking 4 cups of tea daily for increasing antioxidant intake. Based on what I’ve seen about tea, varying types would probably be better because green and white teas are high in some antioxidants and low in others…black, wulong, and puer all have different mixes of which antioxidants in which amounts.